Meet our newest stamps, the Garden Bench Collection. 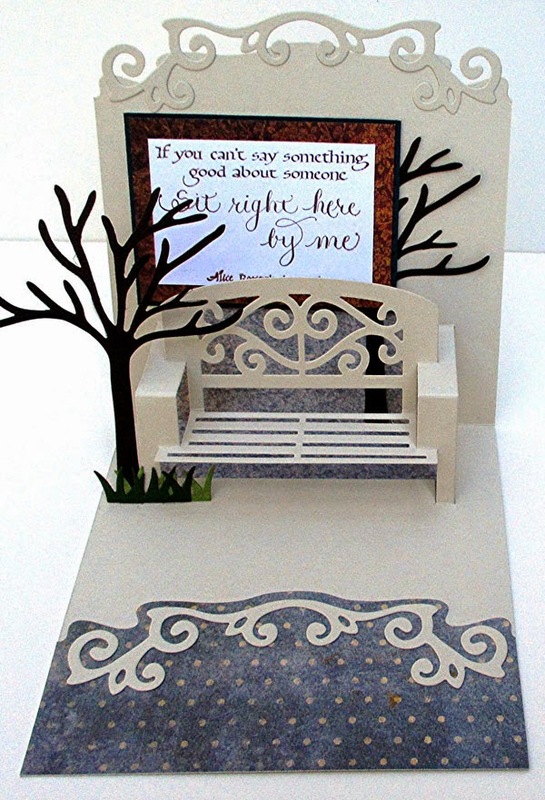 This set was inspired by the Karen Burniston Garden Bench die from Elizabeth Craft Designs which brought back memories of my grandparents' garden bench overlooking Lake Erie. 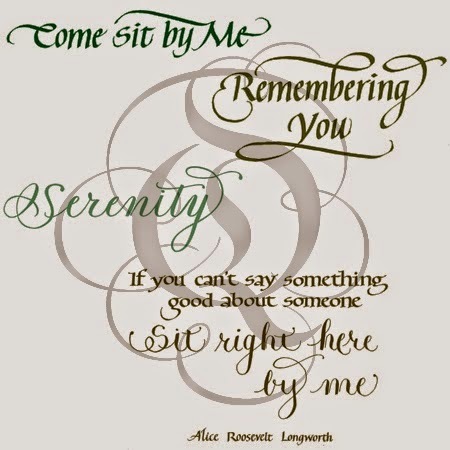 The collection of sentiments evolved from a brainstorming session with designer Judi Kauffman, so it's very appropriate she had the first opportunity to play with them! 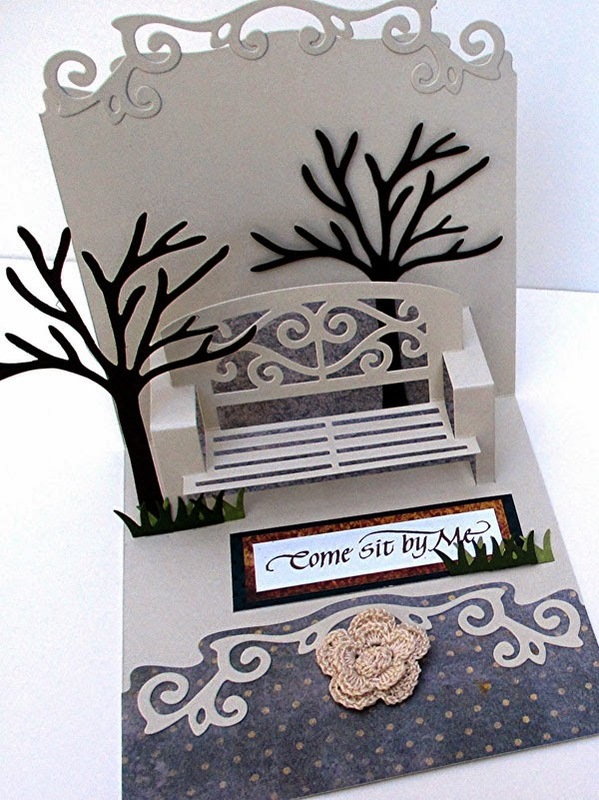 Guest Designer Judi Kauffman created a versatile, elegant card featuring 5 Quietfire Design stamps, the Karen Burniston Garden Bench, All Seasons Tree and Agatha Edges dies from Elizabeth Craft Designs, plus simple embellishments (a crocheted flower or pearl flower button with shank removed). 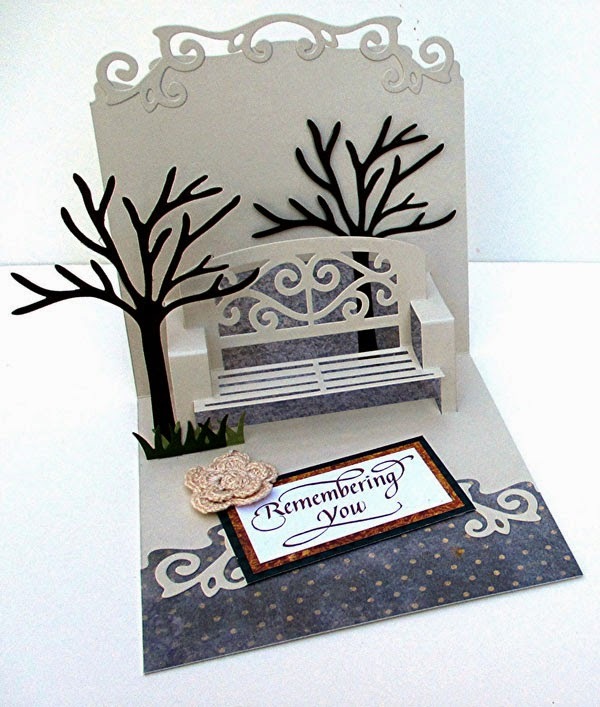 Customize the card by switching the stamped sentiment and the placement of it, the color palette, and/or embellishments, or by adding leaves to the trees. Of course, if you give a designer some stamps, they will use them! Judi continued on with our other new stamps! Many thanks to Judi for sharing her talents with us! Now show us what you can do with our new stamps! 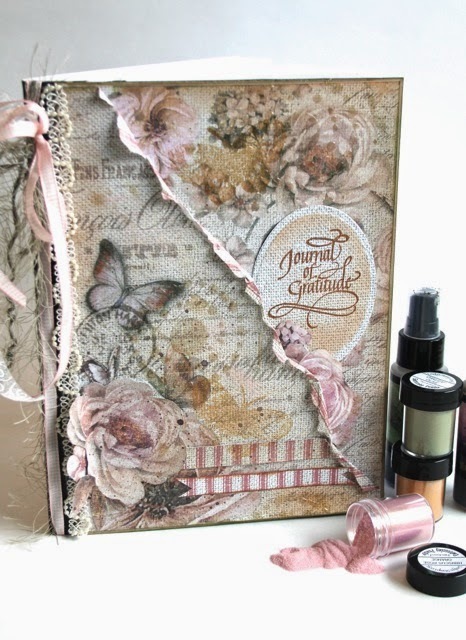 Tuesday Winsday - Journal of Gratitude stamp set! Did you see that gorgeous collection that Teresa posted yesterday using the new French Heritage collection? Now you can make your own Journal of Gratitude with our stamp set if you're our lucky winner this week! P.S. If you don't use Facebook, you can use your email address to enter - we don't share it, but it sure makes it a lot easier to contact our winners! 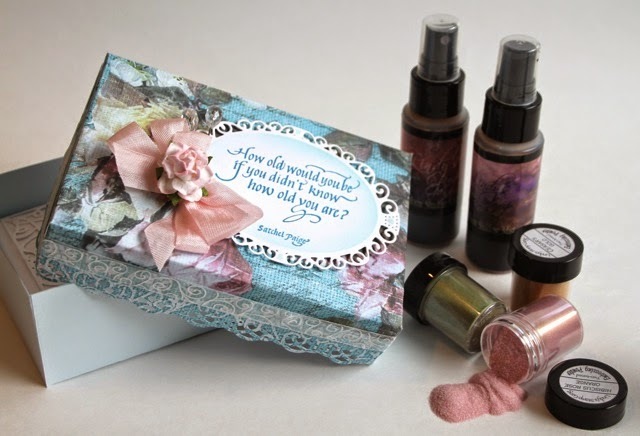 embossing powders are just amazing and so very fun to work with. the blue roses paper set and one of my favorite stamps. stamp to top my box that i created to put a gift card in. I actually created my own box around the die inside of it. need to order a few to make projects with your stamps this spring. work with the set and have such a pretty 2 tone look. that was just released. I love the little birds in this paper set. they are going quick and you don't want to miss out! It's Yogi here and my turn again BIG GRIN. 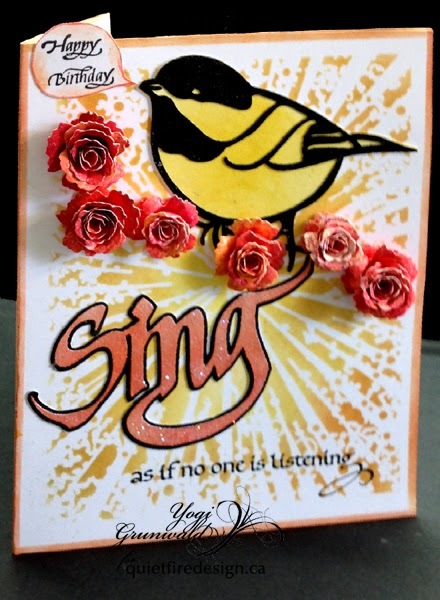 I love the "Chickadee" and that word "Sing" eCut files, and the new Illuminations set, so couldn't resist using them. I'm also using my newest stencil from Memory Box. I had mentioned to my friend when I was buying it that I knew I was going to curse, but bought it anyway... and I was right. All the loose protrusions just want to catch on my sponge... So I decided to give it a light spray of Krylon Easy Tac - YES!!! So here are all the directions for this card. Side folded my white cardstock (5"w x 7"h). Used a Memory Box stencil ("Brilliant") and lightly sprayed the back of it with Krylon Easy Tac, then carefully sponged Distress colors (Mustard Seed, Dried Marmalade & Worn Lipstick). Used a piece of scrap cardstock as a mask and sponged some of the orange around the edges. I eCut the chickadee (it's 4"w) and then eCut it again as a blackout. The blackout I colored yellow and the cut out I colored with a black Zig Writer marker, then applied Versamark and clear embossed. Adhered the two elements together. Adhered to card. Colored a piece of 90# watercolor paper on both sides using Dylusions dye ink sprays (Sunshine Yellow, Pomegranate Seed & Cherry Pie) and lots of water. Tilted the paper to merge and blend colors, then dried with a heat gun. Die cut with Die-Namics "Mini Royal Rose" die set. Used a bead making tool to coil the flower, then let it expand and glued it down. When the glue dried I adhered it to the card. eCut the word sing, then again as a shadow. The top layer I sponged with the Distress pads, then with the Versamark pad and embossed with Sticky embossing powder, sprinkled with Distress "Star Dust" glitter and heat set again. The shadow layer I colored with the black marker, then adhered the two elements together and onto the card. Stamped the rest of the "Sing" quote with Versafine Black Onyx. Stamped the "Happy Birthday" (10 tiny stamp set) with the black and cut it out like a speech bubble, sponged a bit of Distress around the edges and used a colored pencil to outline it, then adhered to card. On the inside I stamped the "Illumination" border, then the Italic capital "D" then the rest of the word all using Versafine Black Onyx and clear embossing. 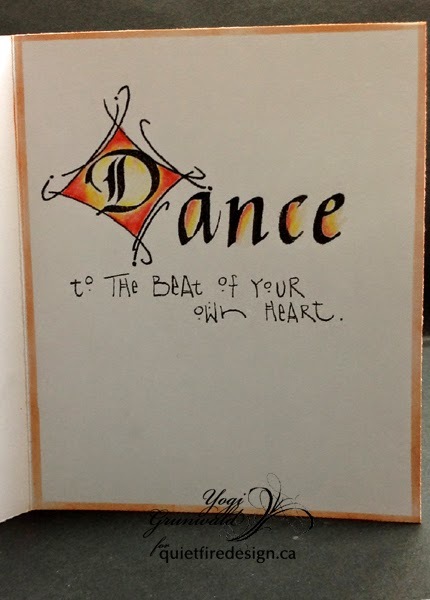 Used colored pencils (red & a yellow) and a Lyra Splendor Blender to decorate the letters. Wrote in the rest of the saying with a Zig Writer. Used the scarp cardstock and the sponge to color the edges. Hello All! 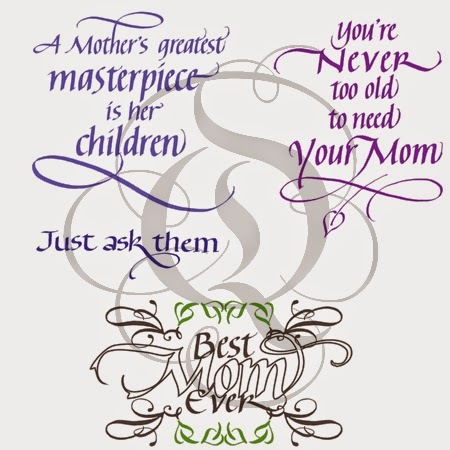 Kathy Jo here to share a few cards I recently made for my mom. She mentioned that she uses a lot of Thank You and Happy Birthday cards throughout the year...so for Mother's Day I am giving her a box of homemade cards! 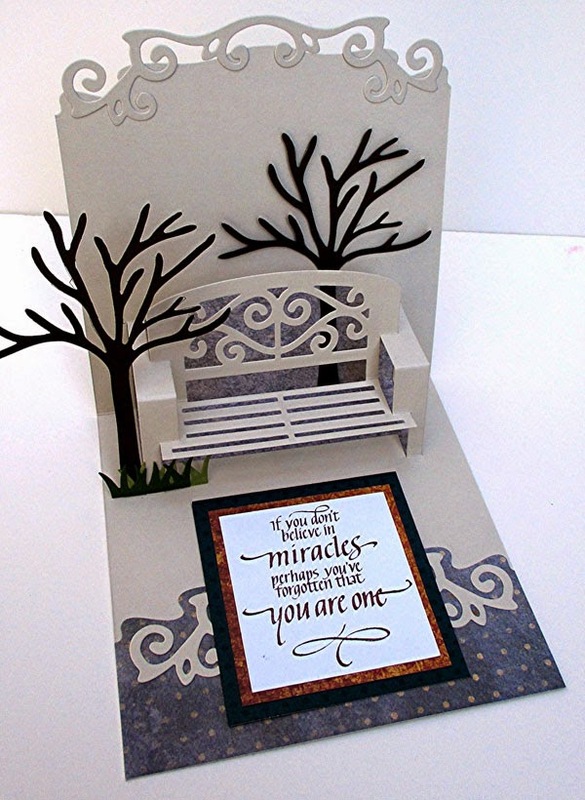 The birthday card was made using Quietfire's Happy Family Days sentiment stamped on a Spellbinders Classic Ovals die cut. I applied Tim Holtz Distress inks in Fired Brick and Spiced Marmalade along the edge. 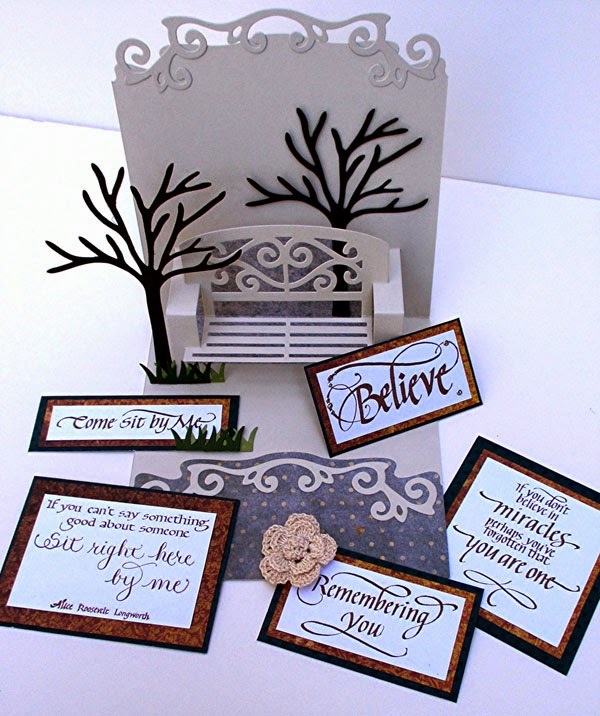 The next layers are a scrap piece of Graphic 45 Secret Garden paper die cut using Spellbinders Floral Ovals and gold paper die cut from Spellbinders new die set Elegant Ovals. 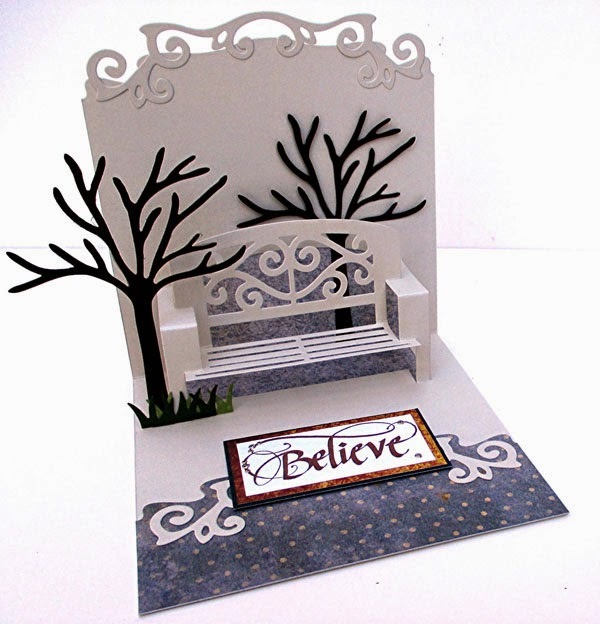 The base is Graphic 45 Secret Garden paper die cut from Spellbinders set A2 Devine Eloquence. 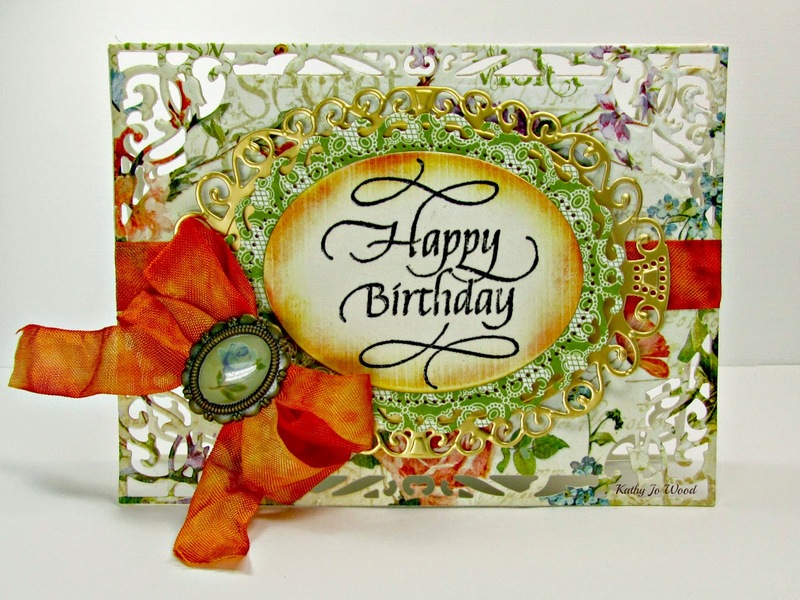 The distressing along the Happy Birthday die cut really brought out the flowers on the base paper. I liked the colors so much that I used seam binding dyed using Tim Holtz stains in the same colors. 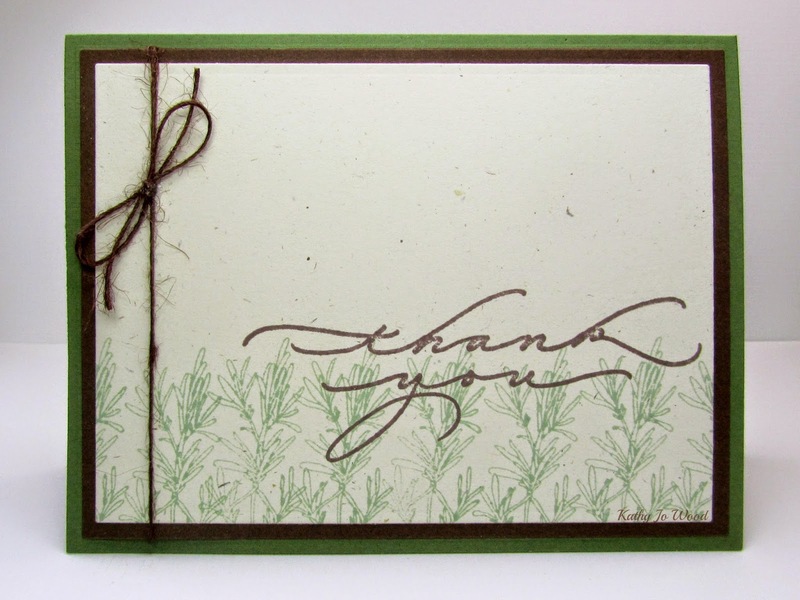 The CAS Thank You card was made using Quietfire's Thank you set and Quietfire's Parsley Sage Rosemary and Thyme set. Tim Holtz Distress Ink in Bundled Sage was used on the Rosemary stamp along the edge as shown. The script Thank You was stamped with Memento's Rich Cocoa. I applied brown twine, adhered the top layer to brown card stock and then applied the layered card stock to a dark green tent fold card. All of the rectangles and card base were die cut with Spellbinders sets A2 Matting Basics A and A2 Matting Basics B. 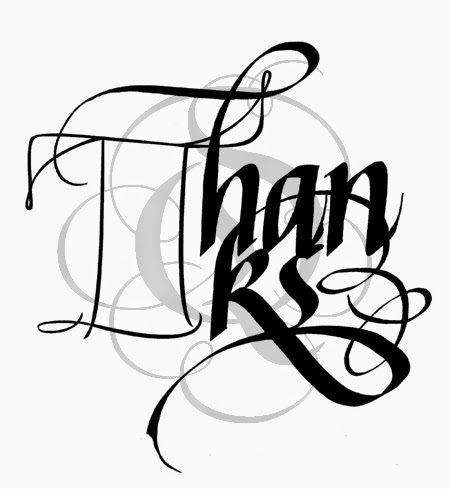 The last Thank You card was also made using Quietfire's Thank you set and Quietfire's Parsley Sage Rosemary and Thyme set. 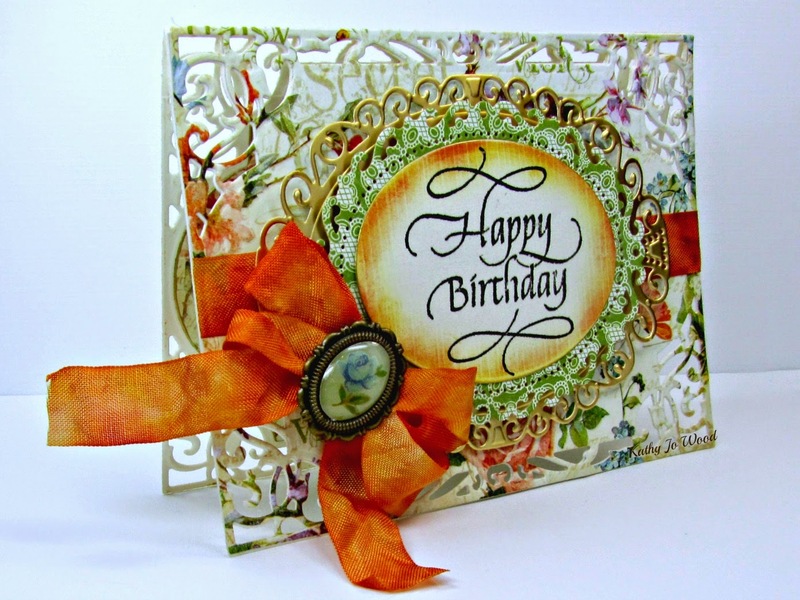 For this card I used the Parsley stamp and Memento's London Fog ink on white card stock. It was die cut with Spellbinders A2 Valiant Honor. Thanks! was stamped with black dye ink onto white card stock and was die cut using the second smallest die from Spellbinders Resplendent Rectangles. Tim Holtz Distress ink in Scattered Straw was applied along the edges and a matching yellow bow was secured under the die cuts. Thanks so much for stopping by and seeing the cards for my mom. I hope you and she both enjoy them! Throw Up Thursday! NEW STAMPS!! Okay, it's Suzanne today and I've been dying to call this Throw Up Thursday, so I did. It's different than Throwback Thursday because we have some awesome new things to share with you! We have new rubber stamps! It's take a long time, but Quietfire is growing up. Starting now, most of our stamps will have the option of Cling and Foam mounting. Did I hear a collective WoooHooo?! Yes, it's true. No more double-sided tape and cutting stamps out. Some of these designs have been in the works for some time and have endured the growing pains and delays of awesome newness. Some are hot off the drafting table in time for Mother's Day (unfortunately we don't have the mounted option for those yet). Garden Bench Collection - Set of 4 - was inspired by my grandparents garden bench overlooking Lake Erie and evolved from a brainstorming session with designer Judi Kauffman. Thanks - Fill 'er Up T For those who like to doodle, but not too much! 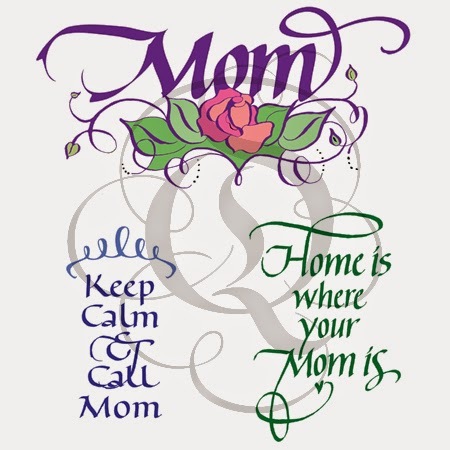 Fill up this T with tangles, doodles, stamp images, paint.... The possibilities are endless! Thanks for stopping in today! We hope you like our new stamps - and our new mounted option! Hello everyone! 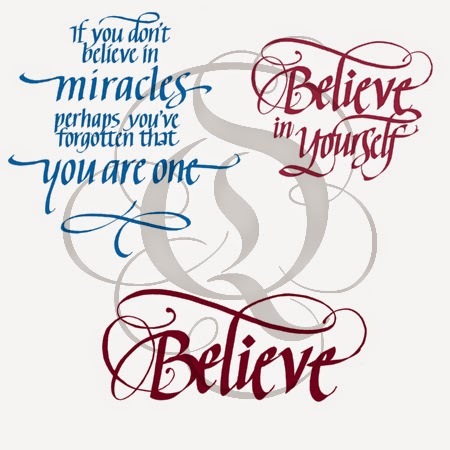 Tammy Tutterow here with you today with another guest post for Quietfire Design. 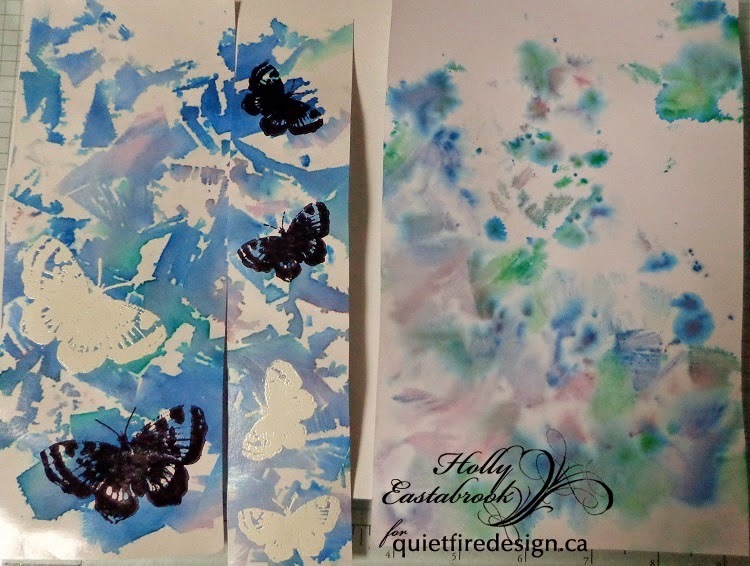 Today I have a trio of ATCs to share with you that feature stamps from Quietfire Design. For each ATC I started with a Ranger Ink manilla ATC. For this ATC I applied Broken China Distress Ink around the edges. I left the center uninked so that it would be a highlight behind the die cut text. I added Vintage Photo Distress Ink around the edges of the card. To embellish the card I layered different elements (Flourishing Inside and I Write You Letters) that I stamped on manila cardstock and cut out with a die cut text from Quietfire's Silhouette collection. After layering the elements, I stamped the word always using some small individual letter stamps from my stamp stash. For the second card, I again used the Flourishing Inside set (I love hearts!). I placed it on a manila ATC that I inked with Broken China, Peeled Paint, and Vintage Photo Distress Inks. I misted the surface with Biscotti Perfect Pearls mist to add shimmer. After misting, I placed a stencil on the card and inked through it to add some design to about 2/3 of the card. I stamped the sentiment (Fill Your Paper) on vellum using Ranger Potting Soil archival ink. I adhered the vellum to my card using machine stitching. I added a piece of trim and curled and tore the edges of the vellum for added texture. My third ATC is my favorite of the three. It is so simple, but I think that lets the beauty of the sentiment (Art is Letting Your Fingers) really be the focus. I created the background by scribbling several colors of Distress Ink on my craft sheet and misting them with water. I dipped the card into the wet inks and dried it with a heat tool. I dipped it again and dried it again. I kept dipping and drying until I was happy with the look. I then applied Vintage Photo Distress Ink to the edges. 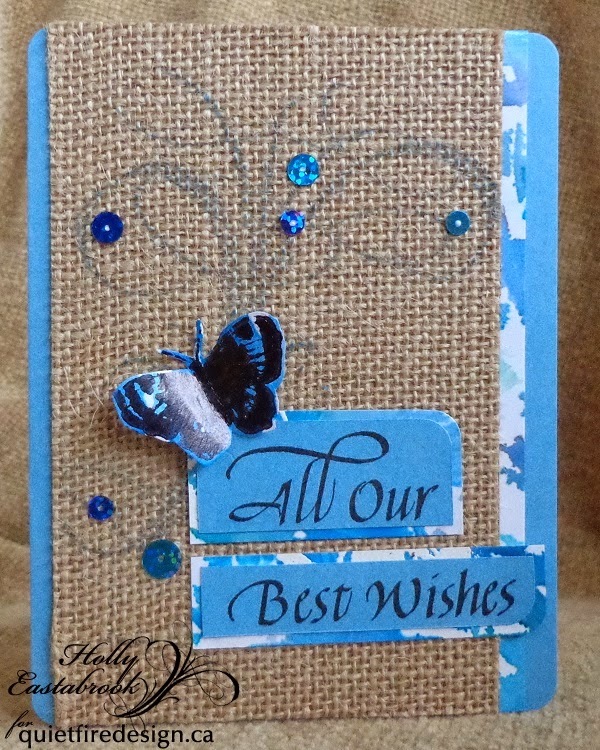 I skimmed Brushed Pewter Distress Stain on the edges of the card as well to add a bit of shine. I again used one of the Flourishing Inside hearts that I stamped and cut out. I stamped the sentiment on a strip of vellum and layered it over the card and sewed it in place. I stamped and cut out a feather from the I Write You Letters set on top of the vellum next to the sentiment. It had been a while since I had made an ATC and this little trio reminded me of how fun it was to make little bits of mini art. I love the way they work together to create a set but also are great individually. I hope each one inspires you to make a little mini art today! 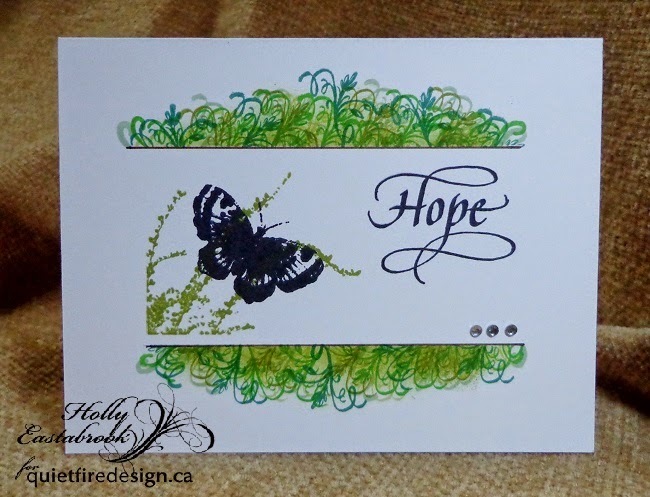 Holly shared a gorgeous card yesterday and one of the stamps she used was from Butterflies/Dragonflies, so that's our giveaway this week! Follow the Rafflecopter instructions. Each time you accomplish a "task", you are entered again. So when you do everything, you can add up a bunch of opportunities to win! Hi Everyone! It's Holly here today, with a fairly Clean & Simple card for you. I began by masking the center panel and stamping along both sides of it. I used a two inch wide strip, and repositionable tape to hold it in place while I stamped. 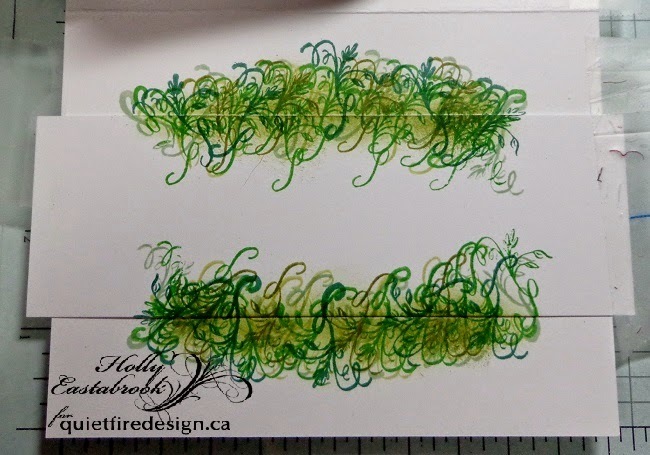 From the HOME-CONGRATULATIONS stamp set, I cut the foliage away from the house, and used it, with a variety of green DISTRESS INKS. I sponged more ink close against the edge of the mask, then removed the mask from the card. I drew black lines along the edge of the stamping, then stamped the center panel. I stamped the barberry bush image from ILLUMINATIONS 1 with Peeled Paint Distress Ink, then over-stamped the image with the small BUTTERFLY, using Jet Black ARCHIVAL INK. 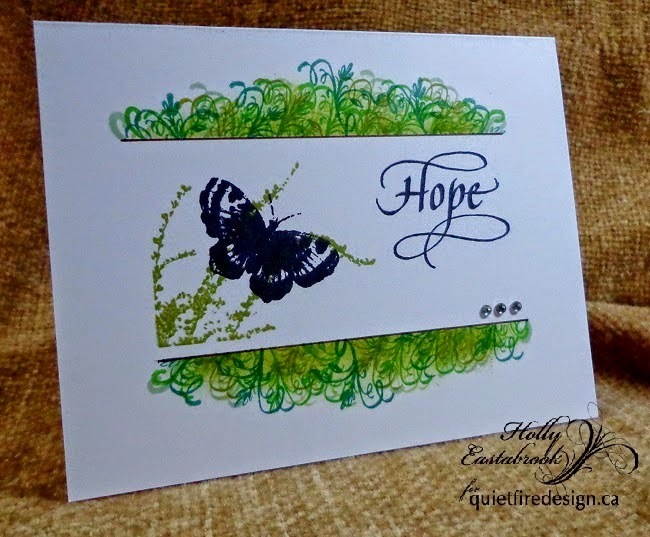 With the same ink, I stamped HOPE from the LIFE JOURNEY WORDS stamp set. I added a little bling from my stash and called it done. Hi Everyone! This is Holly today, sharing a few of my favourite things, on a couple cards. 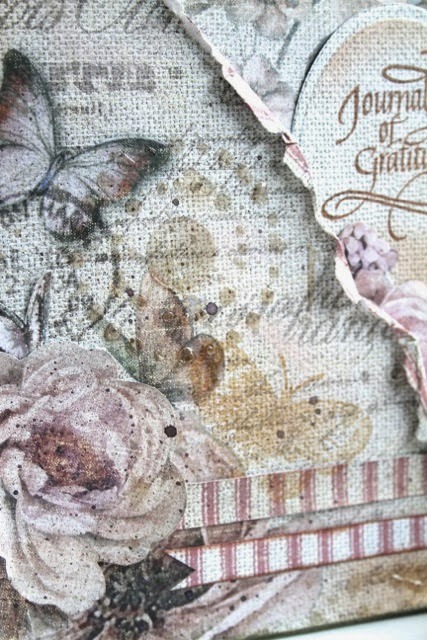 I use the butterflies and flourish stamps a lot- I love them! All Our Best Wishes is becoming a favourite too. 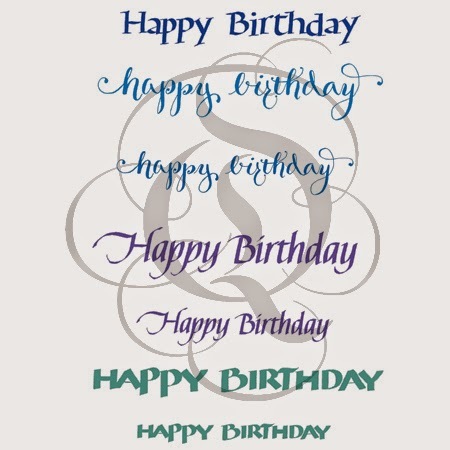 You can find them HERE (Butterflies), HERE (Flourishes), and HERE (All Our Best Wishes). 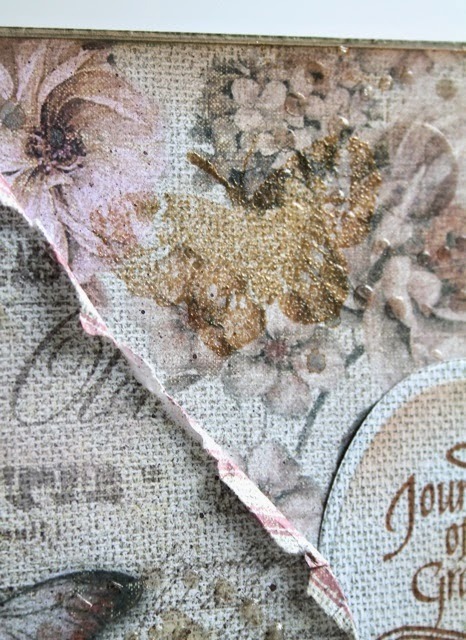 The flourish stamp was used on the burlap paper with Faded Jeans DISTRESS INK. 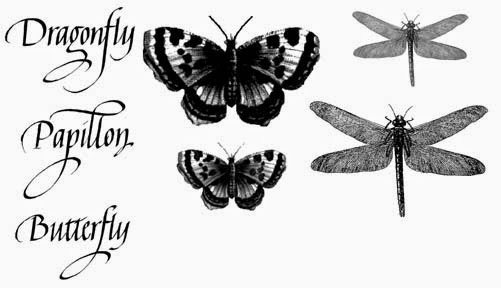 The butterfly and sentiment were stamped with Jet Black ARCHIVAL INK. 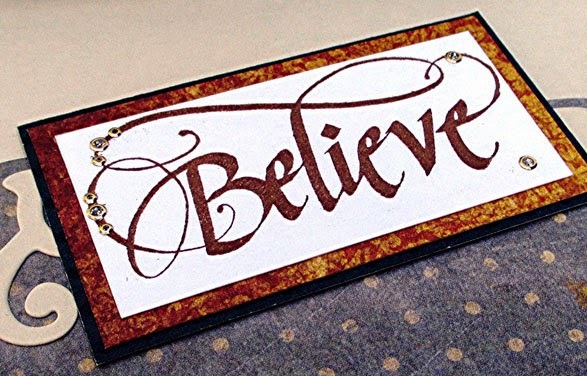 For heavily textured surfaces like the burlap paper, I use ALEENE'S TACKY GLUE to attach cardstock and embellishments.The burlap and sentiment were trimmed out with cardstock showing tissue colour transfer on it. 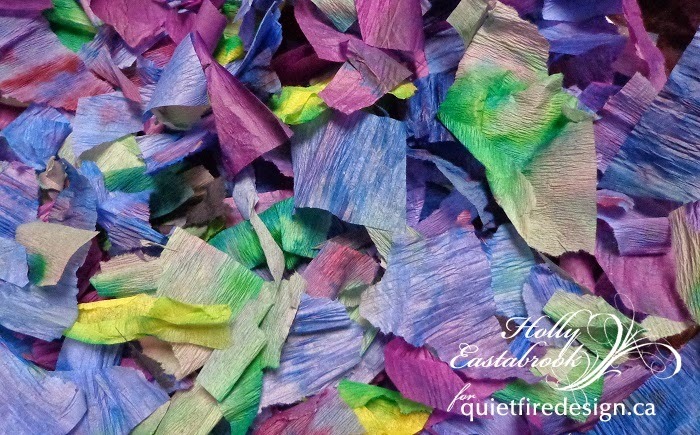 Tear or snip tissue paper or crepe paper ( or crepe paper streamers) into a pile, large enough to cover the cardstock. Whichever paper you use, it has to bleed colour when wet. Some are colourfast now, so you need to check. Spray the white cardstock, matte or glossy, with water, then drop the tissue or crepe paper bits all over the wet cardstock. Set aside and allow to dry. Then brush off the papers, and save to use again. The paper in the photo above have been used twice now. I like how the colour is transferring among the bits and pieces as well. Here you see the glossy cardstock on the left and regular matte cardstock on the right. Two distinctly different results. Then, the stamping with jet black archival ink, and trimming, were done. 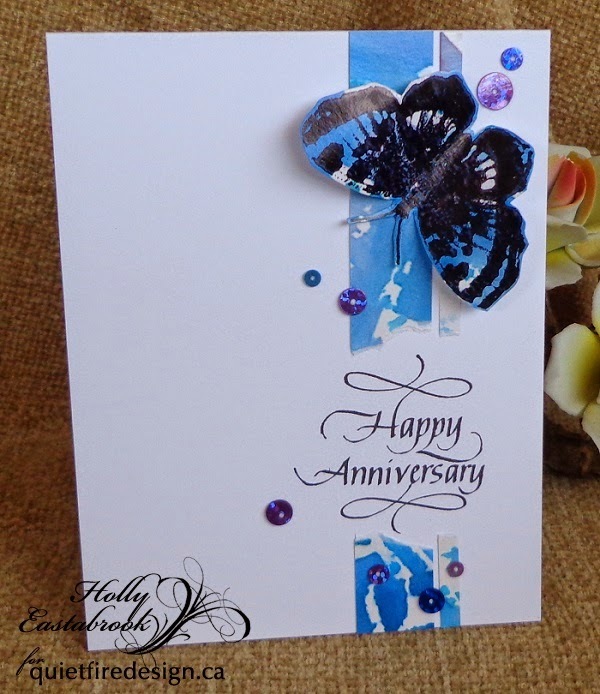 The butterfly was cut out and shaped, the sentiment stamped, and the coloured strips attached to the card base. DH and I are celebrating 36 years so I had to use this stamp from the HAPPY FAMILY DAYS stamp set. Lately, I'm seeing sequins being used a lot, so I pulled out these beautiful blues and purples- thanks for these Jutta! Thank you for stopping by so I could share a few of my favourite things with you. 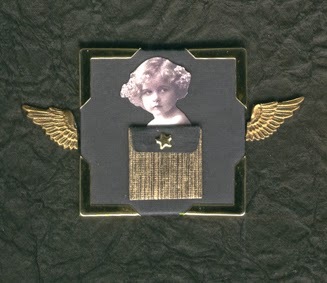 Here is part a little book cover ornament from back in 2008! Use black cardstock to cover a 2-1/4" square of bookboard. Stamp Envelope Template on duplex paper. Fold the envelope and glue. Fold the flap to the outside. Use an awl to pre-pierce a hold for the star brad and insert the brad. Place the book corner on the covered bookboard and crimp in place. Fussy-cut the little girl and pop her into the envelope. Center and glue the envelope onto the bookboard panel. Use Glue Dots to attach the wings to the book. Tuesday Winsday - "If I Had a Star"